Today I am working on Wiki sites. I was suppose to update a fact or SOMETHING to my school site. Then, I was asked to create a site. So this is what I did. Because my school did not have a Wikipedia site, I decided to go to the generic site of Tawas Area Schools and update their page. I changed a couple incorrect things, as the elementary school is no longer PreK-4. Also, the name of the middle school was incorrect. 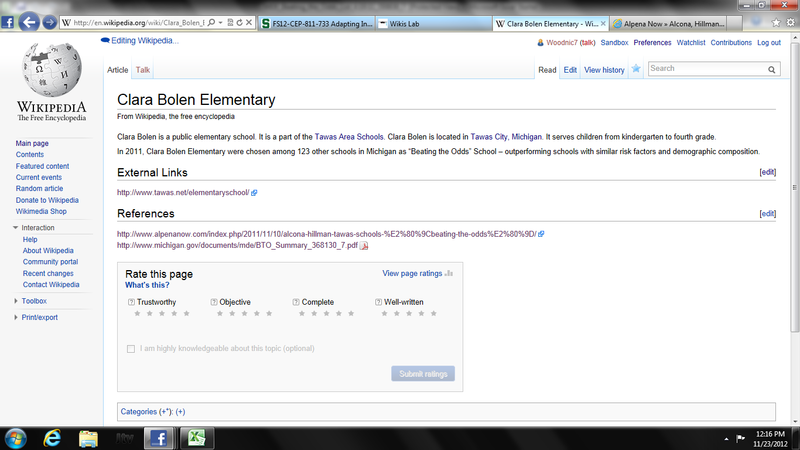 Then I linked the name of my elementary school, Clara Bolen to a new Clara Bolen Elementary Wikipedia page. This was the wikipedia that I was asked to create. I put a few facts about the school. I also attached reference pages to support some of the things I wrote (for example, we won a state award last year, therefore I attached links to reference it). I also linked the Clara Bolen Elementary Site to the Tawas Area Schools and Tawas City, Michigan sites. I also linked the Tawas City site to mine. It wasn't as challenging as I thought it would be! I also played around with Wikispaces, creating a site that looks like this: Mrs. Plank's Page. It was so easy to insert the Widgets... especially the Skype and the Facebook!